UPDATE: Chad, you bag-maniac, you've done it! This is The Jack Pack: Maxpedition MONSOON™ GEARSLINGER I also have a product link to the right of The REAL Jack Sack in case you're interested. I'm going to try and track down the make and model of Bauer's new fashion accessory. It's a napsack, a schoolbag, something a weed dealer would carry around the University of Maryland. No, I'm not happy about it. Sure, it's less gender-bending, but that's why The Jack Sack was so brilliant! 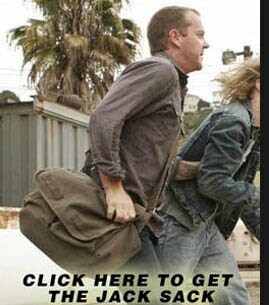 Jack Bauer made it cool for men to wear purses. And now, I fear our masculine dream of redefining what is acceptable male fashion is at risk. For years I've been promoting the idea that men should be allowed to wear skirts (we need the fresh air!) but alas we can't even succeed at handbags. If anyone out there knows the details on Jack's new bag, please let us know. The Pack can definitely not be better than the Sack. Long live the Jack Sack! I wouldn’t worry too much about the Jack Pack muscling out the Sack, Adam. It’s clearly just a work bag he uses, and under only the most extreme of circumstances. Why can't they just bring back the Jack Sack? I bought one, and use it to carry my books in high school. There's kind of no point now that he doesn't use it. Peter- that's crazy talk! First, I believe The Jack Sack will return. But even if it doesn't make an appearance this season, the original man-bag is the Willie Mays of manpurses. We don't cast aside legends because they're no longer active. We honor their spirits through acts of loyalty- wear The Jack Sack- and by God man, wear it with PRIDE. I do use it with pride each and every day. I keep a picture inside of Jack with his to show people if they ask. 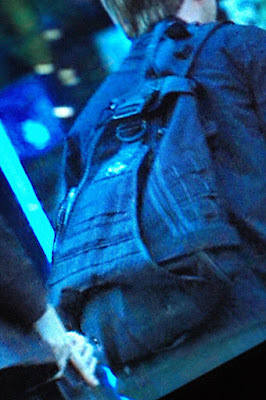 Not to upset anybody, but am I the only one who noticed *Chloe* entering the FBI building with a Jack Sack? How do we feel about this, fellas? TJ- I noticed it as well and will be writing about it later in the week. I think it's a great idea, to be honest. I absolutely love the jack pack!! And I am a tremendous fan of the original jack Bauer man purse. I wore one every day for four years after. That is, until I found out about sling bags! Long have I searched for a sling bag that catered to my every desire, it seems fitting that jack should be the one to bring it to me. Have you seen the specs on this thing? Hydration compatible, hidden gun compartment, external storage, and with military accessory webbing for customization! Not to mention (I think I just came) what every sling bag is missing; a stow able waist support to stabilize the bag so it's easier to run or do anything without the bag sliding around the front! It's near to being the perfect bag.